You nailed the light in this one, Bill. Excellent. Also like how, instead of intruding on the light, you signed in the shadow. I like the strong composition. I like the color and brushstrokes. I love how it all comes together. Man -oh- man!! I love this!! Hats off to you Mr. Wray! Overall Great Design... use of mass and directional lines...interesting juxtaposition / urban symbolism of the Target cart and old car (Vintage Lincoln Mark ??? )...nice spot on social commentary Bill, Congratulations on nailing this piece from EVERY angle! I love this one! It would look so sweet next to "Carport" (subtle hint). Anything can be worked our Kathy, drop me a line. And while I'm thinking of it, do you still have the painting from the Mojave show in 2008? It was a beauty in white! Marc (husband) loved it and still remembers it well. Very good, William, those red cars and a place you know where to build a good scene. Excellent portrayal of light and shadow! Exciting paint application! What unique subject matter! Wonderfully executed too! 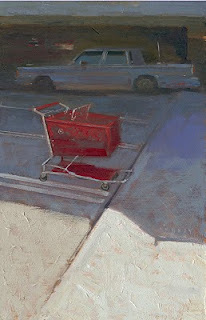 That red shopping cart is soooo going to dent someone's car, I just know it!